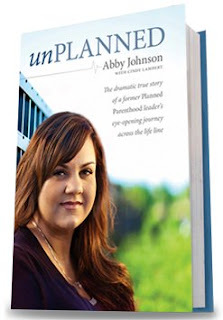 Unplanned is the story of how Abby Johnson went from being the director of a Planned Parenthood clinic to an activist for the Pro-Life movement. Her story is a testament to the sanctity of life and the power of God. One of the things I loved about her book is that it reminds us that not everyone on the other side of the issue is purposely evil or even anti-Christian. Believe it or not, there are Christian women who work in abortion clinics because they truly believe they are helping women. They have the correct motives, but the wrong information. That was Abby's story until God opened her eyes to the truth. Abby's eyes were finally opened when she had to assist with an ultrasound guided abortion. When she saw that baby fight for it's life, it changed Abby's mind forever. However, looking back, Abby saw that God had been working in her life preparing her for that moment for many years. Now God is using her, to not only share the horrors of abortion with the world, but to share the loving and gentle approach that helped guide her out of that industry. The organization Coalition for Life played a key role in Abby Johnson's transformation. The 40 Days for Life campaign that started outside of Abby's Planned Parenthood clinic is now nationwide. Thanks to their vigilance, dedication and compassion they have not only seen many lives saved from abortion but also many clinic workers leave the industry. God is so good. Everyone should read this book. Whether Christian or not, pro-life or pro-abortion there is something you need to learn about it and Abby Johnson has a compelling way of sharing that with you.